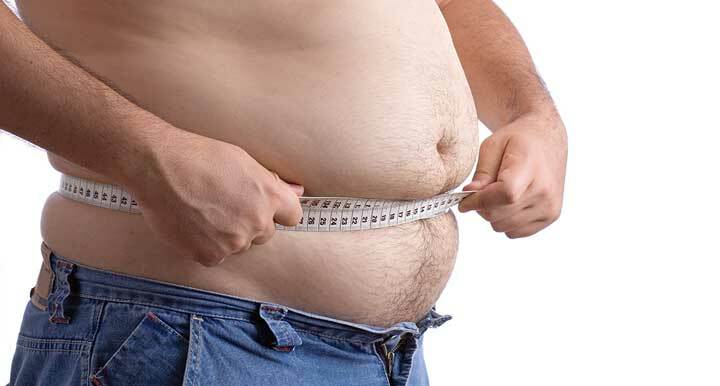 This is some seriously bad news for American men, 66% of whom are overweight or obese. One of the most debilitating side effects of obesity is that fats cells create estrogen - the more fat cells, and the bigger the fat cells, the more estrogen in the body. It gets worse, fat cells also support high levels of aromatase, an enzyme that converts testosterone to estrogen. More fat, less testosterone due to the aromatization of testosterone into estrogen . High fat levels (through increases in estrogen due to aromatase conversion) reduce testosterone, which has its own downside: depression, loss of libido, muscle wasting, bone density loss, heart attacks and other cardiovascular issues, and higher risk of early death. The evidence has been building for years that many neurodegenerative disorders, such as Alzheimer's Disease and other forms of dementia are linked to neuroinflammation (see this article). More recent evidence is showing that inflammation may play a crucial role in depression, schizophrenia, and bipolar disorder. A 2012 article (Maintaining Brain Health by Monitoring Inflammatory Processes: a Mechanism to Promote Successful Aging) in Aging and Disease looked at how inflammation contributes to mental decline, as well as structural and metabolic dysfunctions. The article is freely available at the link above. Maintaining brain health promotes successful aging. The main determinants of brain health are the preservation of cognitive function and remaining free from structural and metabolic abnormalities, including loss of neuronal synapses, atrophy, small vessel disease and focal amyloid deposits visible by neuroimaging. Promising studies indicate that these determinants are to some extent modifiable, even among adults seventy years and older. Converging animal and human evidence further suggests that inflammation is a shared mechanism, contributing to both cognitive decline and abnormalities in brain structure and metabolism. Thus, inflammation may provide a target for intervention. Specifically, circulating inflammatory markers have been associated with declines in cognitive function and worsening of brain structural and metabolic characteristics. Additionally, it has been proposed that older brains are characterized by a sensitization to neuroinflammatory responses, even in the absence of overt disease. This increased propensity to central inflammation may contribute to poor brain health and premature brain aging. Still unknown is whether and how peripheral inflammatory factors directly contribute to decline of brain health. Human research is limited by the challenges of directly measuring neuroinflammation in vivo. This review assesses the role that inflammation may play in the brain changes that often accompany aging, focusing on relationships between peripheral inflammatory markers and brain health among well-functioning, community-dwelling adults seventy years and older. We propose that monitoring and maintaining lower levels of systemic and central inflammation among older adults could help preserve brain health and support successful aging. Hence, we also identify plausible ways and novel experimental study designs of maintaining brain health late in age through interventions that target the immune system. Two easy ways to control and reduce inflammation are an anti-inflammatory diet and regular exercise. Over at Integral Options Cafe, I posted information this morning on foods and supplements that reduce inflammation. June 17, 2013 — Low testosterone worsens the harmful effects of obesity in the nervous system, a new study in mice finds. The results will be presented Monday at The Endocrine Society's 95th Annual Meeting in San Francisco. "Low testosterone and obesity are common in aging men, and each is associated with type 2 diabetes and Alzheimer's disease," said the study's lead investigator, Anusha Jayaraman, PhD, of the University of Southern California in Los Angeles. "Our new findings demonstrate that obesity and low testosterone combine to not only increase the risk of diabetes but also damage the brain." The study -- which was conducted in the laboratory of Christian J. Pike, PhD, Professor in the Davis School of Gerontology at USC and funded by the National Institutes of Health's National Institute on Aging -- consisted of three groups of male mice that received a high-fat diet (60 percent of calories were from fat) to induce obesity. Each group had eight mice and varied by testosterone status. One group had normal testosterone levels, and the second group underwent surgical removal of the testes so that the mice had low testosterone levels. The third group also underwent castration but then received testosterone treatment through a capsule implanted beneath the skin. The high-fat diet, Jayaraman reported, resulted in obesity and evidence of diabetes -- abnormally high blood glucose (sugar) levels and poor glucose tolerance, which is the ability to clear glucose from the bloodstream. Compared with the group that had normal testosterone levels, the testosterone-deficient mice had more body fat, higher blood sugar levels and poorer glucose tolerance, she said. After blood testing, brain tissues from the mice underwent analysis for changes. The brains of obese mice showed substantial inflammation and were less able to support nerve cell growth and survival, according to Jayaraman. These damaging effects of diet-induced obesity were significantly worse in mice with low testosterone, she said, adding that control groups of mice fed a normal diet did not show these changes. "Our findings suggest that low testosterone and obesity interact to regulate inflammation of the nervous system, which may increase the risk of disorders such as type 2 diabetes and Alzheimer's disease," she said. Because many of the negative outcomes of the high-fat diet were eased in the group of mice that received testosterone therapy, Jayaraman said that "testosterone treatment may be useful in reducing the harmful effects of obesity and low testosterone on the nervous system."